We review the new Crime & Punishment expansion for the Firefly board game. The Firefly Crime and Punishment expansion adds a few new mechanics to the base game, yet doesn't increase the complexity making it easy to get to the table. Is it possible for a game to have too many expansions? If you love a game, the answer is clearly no. This is especially true if you have a game you get to the table quite often and want more variety. This is the 7th expansion for Firefly: The Board Game (review here), with our last review being of the Kalidasa big box expansion. While that sounds like a lot, all but two were only small box expansions that just added a couple of things. So let’s dive into the Firefly Crime & Punishment expansion and see how it adds more adventures in the ‘verse for you. Unlike the big box Blue Sun and Kalidasa Expansions, Firefly Crime and Punishment is on the smaller side, about on par with the Pirates & Bounty Hunters expansion (yet deeper than Jetwash or Esmeralda). Firefly: Crime & Punishment comes with two new setup cards and two new missions. The biggest change that the Crime and Punishment expansion adds to Firefly are the Alliance Alert cards. 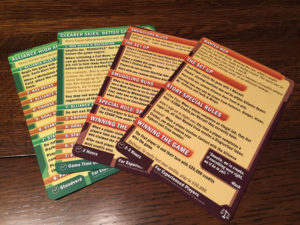 These are thematic event cards that slightly change the nature of the rules. One is put into play at setup, with some misbehaving cards or nav cards changing the Alert card out for a different one. Some examples of Alert cards are not letting you sell cargo to contacts, having the Alliance Cruiser move an extra space, or disgruntling your whole crew when you botch a job. 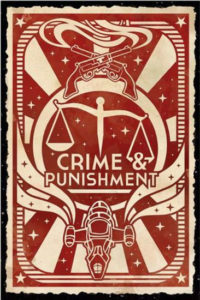 Crime and Punishment also comes with a pile of new misbehave cards. 40 in total, these tasks will certainly test your luck (or preparation) and have a variety of effects. Some introduce new rules, such as splitting up your crew or making your crew wanted. 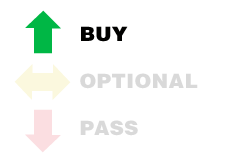 There is also a new proceed condition that will let you pass if you are solid with a specific contact. Finally, in addition to a few cardboard tokens, the expansion comes with two new setup cards and two new story cards. These will add a bit more variety for those who are Firefly veterans. The Alliance Alert cards slightly alter how the game is played. One great thing that the Firefly Crime & Punishment expansion is that it does not require any more table space to use. Even before the expansions, Firefly was a bit of a table hog. Once you add in Kalidasa and Blue Sun, it pretty much demands a large table to play (I actually bought a card holder to use just for this game). So I was happy that there was not increase in space required. My favorite part of the expansion has to be the Alliance Alert cards. I like how these can alter the game play. There are definitely some that will force you to think twice about your strategy. 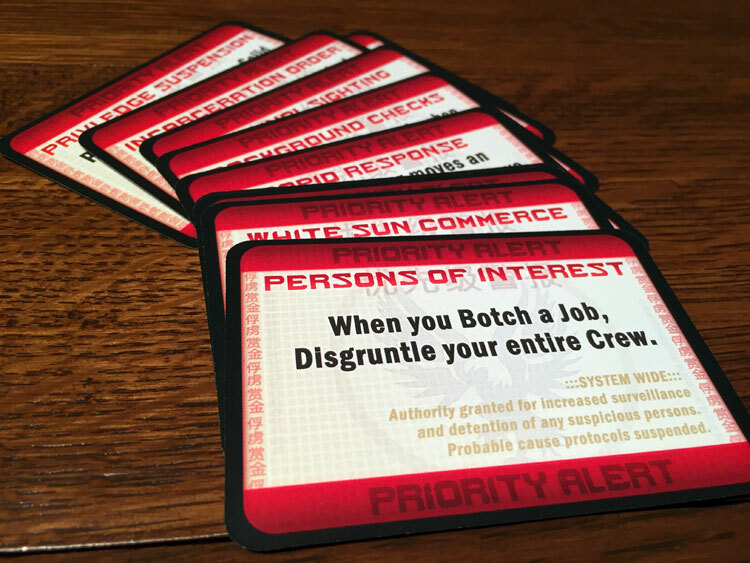 Such as the card that forces you to disgruntle your entire crew if you botch a job. When that card is out, I make darn sure I don’t screw up a mission. The nice thing about these is that they integrate into the game pretty easily without requiring you to learn a new ruleset. This also applies to the new misbehave cards which you can simply shuffle into the misbehave deck. And once you do, I don’t ever see a reason for you to fish them back out. And that’s really the hallmark of a great expansion. It adds variety to my game without ramping up the complexity. And that’s really what this expansion adds: variety. It doesn’t contain any big maps like the Blue Sun or Kalidasa, and it doesn’t add crazy new concepts like Pirates and Bounty Hunters did. It’s really more of the same good stuff that you love about firefly. 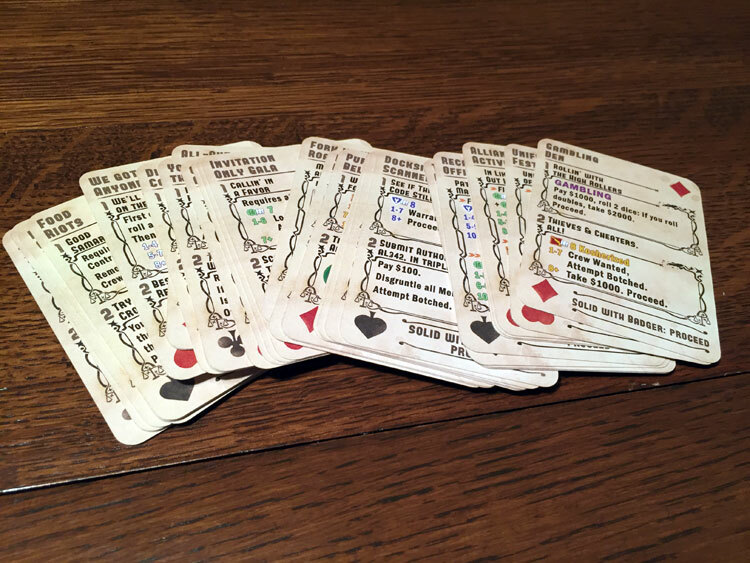 The amount of misbehave cards are doubled from 40 to 80 now, so players rarely see the same misbehave card twice during a game. And the new story missions are really for experienced players (the missions even label it as such) because they are more geared towards players who like to cause trouble and skirt the law. The new misbehave cards double your amount of cards and add a few new mechanics. If this were another big box expansion for Firefly, I might have to tell you to give it a pass, if for no other reason than lack of table space. But that’s not the case. It’s small in both size and price, and it integrates seamlessly into the base game. So at the end of the day, the question remains, should I get this expansion? If you don’t own any Firefly expansions, Crime & Punishment is a great one to start with. If adds a nice amount of variety without overloading you with new rules. And if you already own every Firefly expansion, you are probably going to be buying this anyway, but it’s nice to know that it doesn’t add to the game’s footprint. I think the variety is worth the low price point. Publisher Gale Force 9 has done a great job of keeping their Firefly line fresh with new content and Crime & Punishment continues the trend. Although I’m probably reaching the upper limit for content for Firefly, as the box is already bursting at the seams. 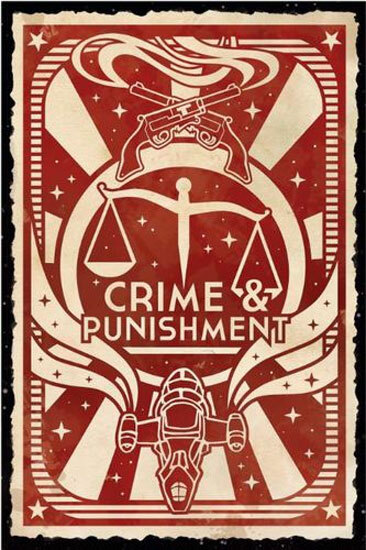 If you’d like to get a copy of Firefly: Crime & Punishment, you can get it for about $15.